Vertaald door Een inzichtelijke recensent heeft vrij veel sloeg de spijker op de kop: 'Als je wilt veel plezier gaan hier!'. De Greg en Tom Hostel is alles over het hebben van plezier; ze bieden goedkope accommodatie dicht bij de oude binnenstad van Krakau, en met een overvloed aan gratis eten en 'club kruipt', bent u gegarandeerd alles wat je nodig hebt voor het maken van nieuwe vrienden en laat je haar naar beneden te vinden. Ze serveren ook 'echte kwaliteit restaurant eten' elke avond in het restaurant en 'de toiletten zijn goed genoeg om in te slapen'. Moeten we nog meer zeggen? FREE BREAKFAST, FREE DINNER and FREE BEER HOUR - you won't get a chance to get it in any other place! 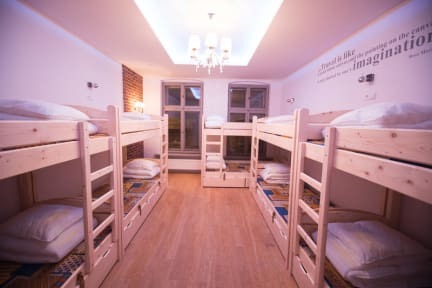 With no doubt the best located hostel in Krakow! We are in the heart of Krakow's Old Town - Florianska Street 43. 10 min from the Main Bus and the Train Station, just 3 minutes from the Main Market Square! The most famous street in Kraków, no one will be bored here! Beer House is surrounded by all most important spots in the city and is located in the centre of the nightlife. We offer 9 different sized dorms, from 4 up to 12 bedded to make it easier for you to meet the fellow travellers and to socialize! All of them are comfortable, spacious and have a delightful view to Krakow's Old Town. Equipped in comfy beds, lockers, safe boxes, reading lights. All with NO EXTRA CHARGE! To make you stay even better we're serving FREE BEER from 9PM till 10 PM, raise a glass for a good night! Communist Nights and many more! Don't forget that Beer House has also amazing PUB and RESTAURANT where you can eat delicious food, drink amazing cocktails prepared by our crazy bartenders! Best way to meet locals from Krakow and Party together as Polish people do! During the day you can also enjoy the wide range of tours (city and regional) as Auschwitz-Birkenau, Salt Mine, Tatra Mountains and many, many more. We made sure we have the possibly best rates for our guests! During the summer we are going with our guests for the daily events - BBQ, Jewish District, Football Matches and more! What else could be better? Come and visit us, you will be more than satisfied and believe us - that will be the best, unforgettable stay in your life! IF YOU ARE COMING JUST TO TAKE A REST - THAT'S NOT A PLACE FOR YOU! WE HAVE PUB CRAWLS EVERY NIGHT, THAT'S NOT A CALM AND QUIET PLACE! Wat een geweldig hostel! Het bevindt zich midden in het oude centrum van Krakau. Het personeel is ontzettend vriendelijk en behulpzaam en het hostel is bijna te goed om waar te zijn: gratis diner met bier, gratis ontbijt, gratis fruit: het buffet is werkelijk heerlijk. Daarnaast is er elke avond een pub crawl en zijn er daarnaast nog heel veel andere activiteiten. Ik raad iedereen aan om in dit hostel te verblijven! Everything was awesome. The only thing where they can improve are the thin mattresses. This is a fantastic hostel. I enjoyed my stay. You get a better breakfast there than in a five star hotel. You can also sit down at the table for the free dinner. Very tasty! Be sure to also do the pub crawl. I hope they quickly restore the showers on the first floor. Then it is definitely a 10/10. I would definitely come back! Great hostel!! They offered so much additional things! The breakfast and dinner included were really good. Would definitely recommend! The free breakfast and dinner in the hostel are of great quality and are a great way to meet new people. The pub crawl does take you to the same clubs (in a different order) every day, despite definitely worth joining. Unfortunately, the dorm rooms are not of great quality as the beds are quite old and some sheets are dirty or contain holes. For the extreme low price, a very nice stay! Also a very extensive breakfast and even a possibility of free dinner at night. Sometimes it was a bit smelly and sandy inside but also gave it a little bit of character. The only real letdown were the beds; super stiff, hard and squeaky.. hard to get a good rest. But next to that the staff was really kind, the food was nice and there were many facilities (no waiting for the shower! ).